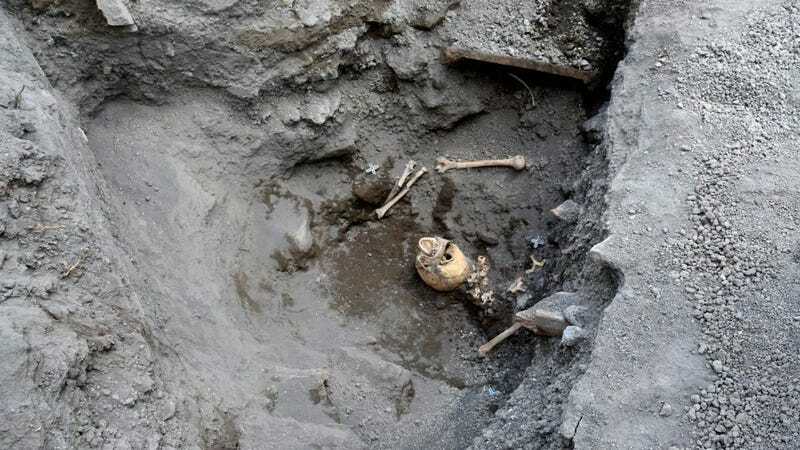 Last month, archaeologists in Italy found the skeletal remains of a Pompeii resident who apparently had his head crushed by a giant rock while fleeing the eruption some 2,000 years ago. The victim’s skull has now been recovered, and its surprisingly pristine condition suggests an alternative cause of death. Mount Vesuvius erupted in 79 AD, killing thousands of residents in the ancient Roman city of Pompeii. The eruption is particularly famous for the effects of its pycroclastic flow, a dense, fast-moving cloud of hot gas and fragments that locked many of its victims in their final death positions. Excavations in May revealed the man’s skeleton, but not his skull. 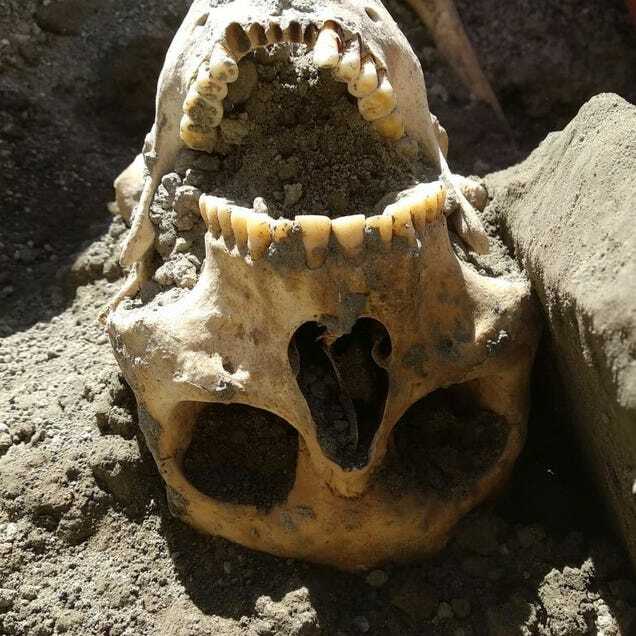 New excavations at the Royal V site in late May uncovered the remains of a previously undiscovered Pompeii victim, a man in his 30s who appeared to have been crushed by a large rock while attempting to flee. The rock, weighing about 650 pounds, likely came from a door frame, called a jamb, pinning the victim to the lapilli, a layer of small volcanic stones. The skeleton, sans skull, was found atop this layer, and the archaeologists figured the head had been thrust deep into the lapilli by the force of the falling rock. This initial interpretation, however, now appears to be wrong, owing to the discovery of the man’s undamaged skull. The skull, in near perfect condition, does not exhibit any signs of trauma, or other indications that it was struck by a falling stone. Its presence in the lower level is likely due to a tunnelling effect that happened relatively recently, when sections of the ground collapsed in the 19th century. This tunnelling took the skull and bits of of bone along with it, leaving the rest of the skeleton—and the large stone—in their original position. 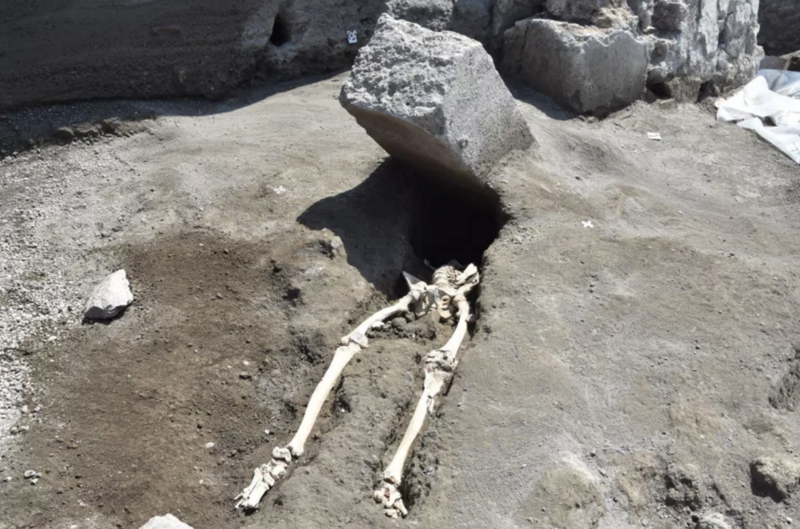 It was only after he died, the archaeologists now argue, that the large stone fell upon his body. Interestingly, the ongoing excavations at the Royal V site also uncovered the man’s coin pouch, which he slung around his neck. It contained 22 silver and bronze coins worth about 80 sestertii, which would have been enough to sustain a family for about two weeks. So the man, perhaps a merchant of some sort, was desperate to save his stash as he was trying to flee the volcanic eruption — a task made all the more difficult owing to the bone infection in his leg.